Frosty - Part 2... 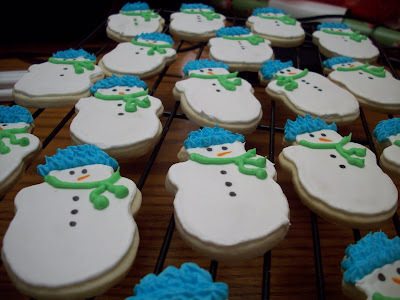 Since I had a love for all things snowman this weekend, I decided to make little Frosty sugar cookies as well. I also made a few ornaments so I wouldn't get bored just decorating snowmen. I used the same sugar cookie recipe that I made a few weeks ago for Thanksgiving. You can find the recipe for both the cookie dough and royal icing here. 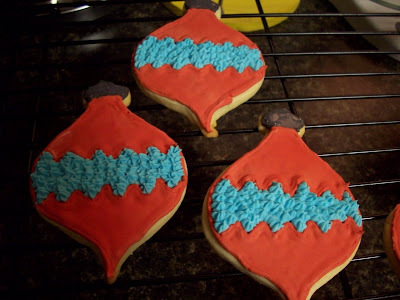 While decorating with royal icing takes a little while to do, it is a pretty straightforward process. When you make a batch of royal icing, divide it into small containers so you can color whatever you need. I recommend using gel food colorings so you don't dilute your icing. Once colored, you may need to add a few drops of water to thin the icing enough to pipe. It should be easy to pipe onto cookies and not require a lot of effort or make your hand hurt. If its hard to do, thin your icing a little. To pipe the outlines, I use a Wilton tip 2 or 3 depending on the size of the cookie. 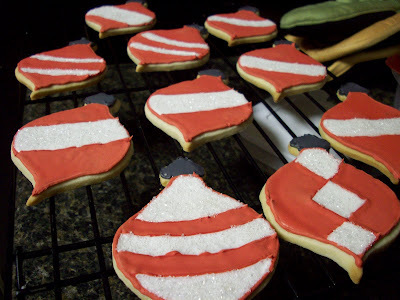 Once your cookies are outlined, let them dry for at least an hour. While you aren't using your royal icing, make sure to cover the containers so it doesn't dry out. If you are going to store them for an extended period of time, place a piece of plastic wrap directly on the surface of the icing and then cover with the container lid. To fill in the cookies, add more water to you icing in small amounts until it is the consistency of thick syrup and easily runs off your spoon back into the bowl. The runoff should "melt" back into the bowl and show no signs of disruption after about 5 seconds. Once you have the right consistency, fill another piping bag or squeeze bottle with icing. I recommend investing in the squeeze bottle as it is much easier to control the flow of icing and prevent the icing from just continuously running out of the piping bag. You can usually find them in the cooking supply aisle at Walmart and the like for less than a couple of dollars. Fill in the cookies by squeezing icing into the center of the cookies, leaving a thin margin around the edges, the icing will "flood" out to fill in the cookies, use a toothpick to help it into corners and pop any air bubbles. 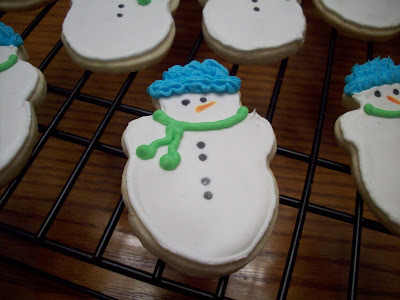 Let the flooded icing dry overnight (at least 12 hours) and then decorate as desired with the original strength royal icing. 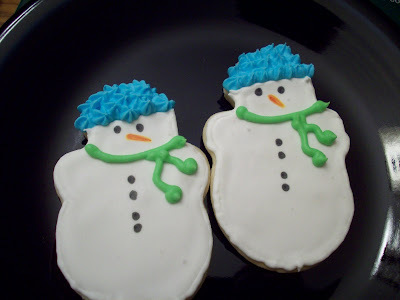 For these snowmen, I used edible markers to decorate the faces and buttons. I used a Wilton #16 star tip to give the hats some texture, and a Wilton tip #3 to do the scarf. For the ornaments, I used the #16 star tip for the blue centers, and white flooded icing and white sanding sugar for the others. These are the cutest! Too cute to eat. i'm jealous of your frosting skills! those are adorable! !